The Tapsell Gate at East Dean - office23s jimdo page! 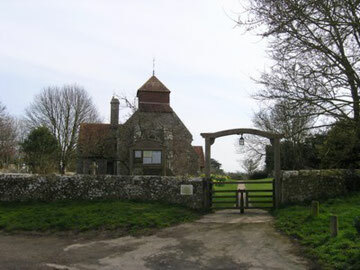 The Tapsell Gate, Church of St. Simon & St. Jude. The Village Pond, East Dean. "The earliest documentary evidence now available is to be found in the margin of the XVIIth century Church Register. This records the fact that, during the Commonwealth, the populace cleaned out the pond and removed three large stones from the bottom. These stones are supposed to have been used to form the mounting block or stile, which can be seen alongside the churchyard wall to the south of the Tapsell Gate. 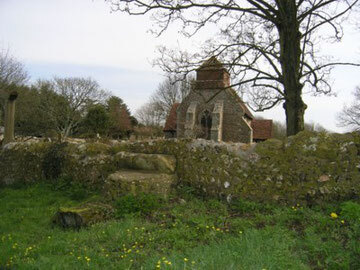 The Mounting Block or Stile, East Dean. Amongst the XIX century papers of the GAGE family is a record of a lawsuit over the rights of watering cattle at the pond, which indicate that the ownership of the pond was in doubt. In the 1950's, as its ownership could still not be established, the Parish Council took over the pond and has maintained it ever since. The Parish Council wrote to the appropriate authority, asking if it could be scheduled as an Ancient Monument. 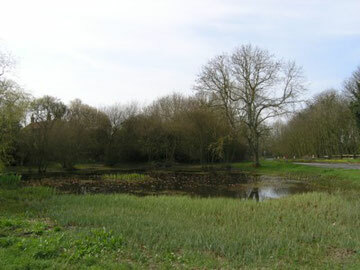 In 1974 the Ministry of the enviroment agreed, being satisfied that the pond was man made as opposed to natural, and it became one of the first such ponds in England to be protected in this way. The Tapsell Gate is a reproduction of the original one designed by a man called Tapsell, a Sussex blacksmith in the early XIX century. The original version was constructed of iron and, when open, provided a rest for coffins and easy access for the bearers when a funeral procession was formed."